No doubt, Uber Technologies has now become the world leader in cab services. The company is headquartered in the USA and operates in 633 cities around the globe. Uber provides affordable and comfortable cab rides which you can book anytime and whenever you need. Under the UberPool service, you can book a cab at just ₹49 rupees for up to 8 KM. So it is quite affordable and convenient to use. Just like Uber provides affordable and comfortable cab rides it also follows a strict set of rules. One of the rules states that deleting your only active payment method is not allowed, which is your credit or debit card. According to Uber technologies, you should have at least one payment method active all the time to request cab services. The payment method can be UPI, Paytm, JioMoney, PayPal (If you live in the USA), or a credit/debit card. Uber doesn't consider cash as an active payment method. ➜ Important Tip #1: So, if you have just signed up for this cab service then I suggest you not to add your credit/debit card in the app and keep using the cash option as the active payment method for all your rides. However, if you have already added your credit/debit card in the Uber app then you can follow the instructions below to remove it from the app. Actually, we are not allowed to remove an active payment method once added. All we can do is to setup another active payment method and remove the previous one be it your Uber credit card, debit card, e-wallet, Uber wallet or PayPal. 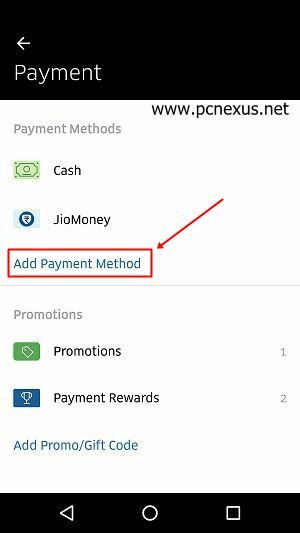 ➜ Important Tip #2: This tutorial works for the Uber users in India only as we will be using JioMoney to remove the credit/debit card details from the app. However, if you live in the USA or Uber London (credit/debit card) then you can use PayPal as a new payment method to remove your credit card details. Sign up for JioMoney. Download the app from play store and follow the setup process. You will have to provide your name, age, and the mobile phone number that will be linked to your JioMoney account. Finally, you will be asked to set up a 4-digit mPin. After setting the mPin the app will open. Tap 'Add Money'. Enter the amount that you want to add. Here again Uber applies another rule. Your JioMoney wallet should have at least ₹350 rupees to request cab rides. Don't worry it isn't necessary that you spend entire ₹350 rupees with Uber. You can request a UberPool ride at just ₹49 and still can remove your credit card or debit card details. To load the money in JioMoney wallet you can use net banking or credit/debit card. If you are using your credit or debit card then do not put a check on "Save this card for faster transaction". After loading the money into your JioMoney wallet open the Uber app and go to 'Payment' by tapping the menu button on the top left corner which looks like three parallel lines. Here tap 'Add Payment Method'. In 'Payment Method' select 'JioMoney'. Enter your number if asked and enter the OTP if you receive. The Uber app will now access your JioMoney wallet and it will also show the money left in it. That's it, you have added a new payment method. Now we have to remove the credit card or debit card details. In the 'Payment' section tap your card. It will show the last four digits of your card and the expiry date. 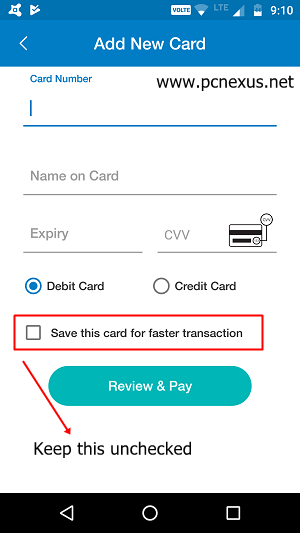 Now tap the three vertical dots on the top right corner and tap 'Delete payment method'. After tapping the delete option your card details will be removed from the Uber app instantly and now you can only book cabs either via cash or JioMoney. 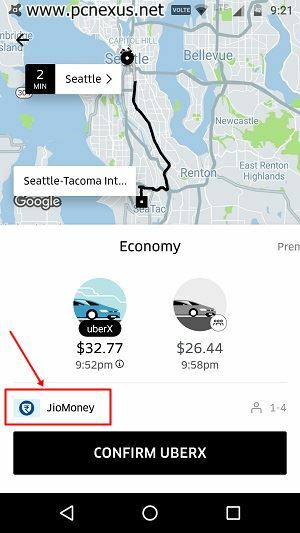 ➜ Important Tip #3: If you are using JioMoney then Uber will automatically charge your wallet after a ride gets over. This will happen only if you have a minimum balance of ₹350 or your ride cost is less than your wallet's balance. You can't request a ride if your e-wallet doesn't have enough money. 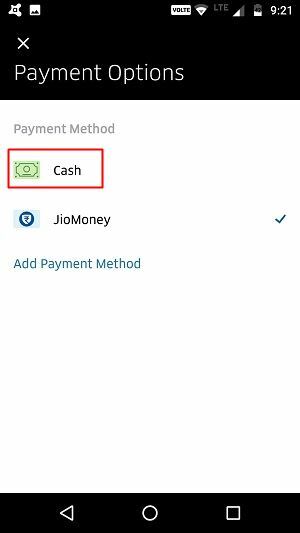 Now after removing your card details you can still select cash payment and set it as default payment method over PayPal (for US users) or JioMoney e-wallet. To do this follow the steps below. Open the app and enter your location in the 'Where to?' text field. You can enter your nearby location. Now Uber app will give you options for different cab services like UberGo, UberPool, UberXL, and Uber BLACK. Under the car, icons tap the 'JioMoney' icon and select 'Cash' as a payment method. You don't need to confirm a ride. Now cash will be the default payment option on every new ride that you request. However, if you request rides that you have taken before then the payment method will change to the older one if it exists in your account. But you can change it as I told you in above steps. 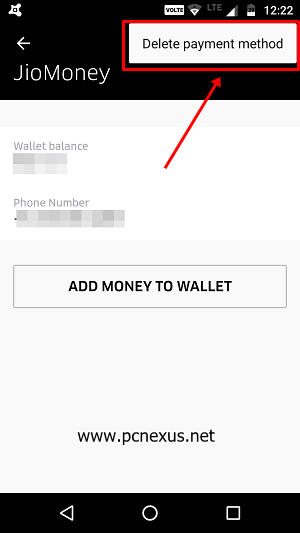 ➜ Update #1: As per new app update the cash can't be set as default Uber payment method. Before requesting a ride you will have to change the payment method to 'Cash' every time. As per Uber terms, we can't remove an active payment method without adding a new one. So you can't remove your JioMoney wallet from Uber but you can disconnect it from Uber. After you de-authorize Uber from using you JioMoney wallet then it can no longer access your JioMoney wallet. You can't add money to your JioMoney wallet via Uber either. To de-authorize Uber open JioMoney app and tap the menu button on the top left. Tap 'Security & Settings'. Here tap 'Linked Merchants'. From this list remove Uber. Now Uber app can no longer access your JioMoney Wallet. Please note that you can't re-authorize Uber without removing the JioMoney from payment methods. ➜ Important Tip #4: If you are using Uber app then don't forget to associate an email address with it. Uber provides two types of user accounts 'phone-only user' and the 'user with a registered email and phone number'. If you are a phone-only user then always remember your password because there is no way to reset the password for a phone-only user. Associating an email address would be good because you will receive all the receipts and promotional codes quickly on your email if you ride a lot. So, this was a post about removing your credit card and debit card details from the Uber app. If this article helped you then please take two minutes to share this.